Hot drinks such as coffee and tea are the lifeblood of today's workforce. 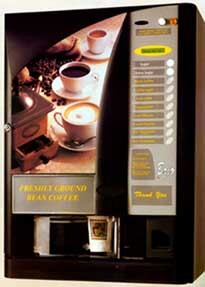 Keep your employees and your customers happy with superior tea and coffee vending machines from Cool Refreshments. Our Bayonne, New Jersey, company offers 2 main product options, either of which are a great choice for your company. 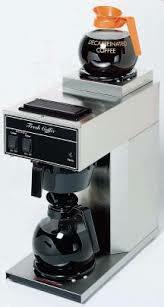 Please take a few minutes to read about our tea and coffee dispensers. These days, it seems everyone is clamoring for a wider variety of their favorite hot beverages, such as gourmet coffee, cocoas, teas, and hot specialty drinks. 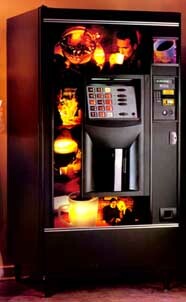 When your employees and clients want a tasty hot drink, the Cafe Diem is an excellent option. 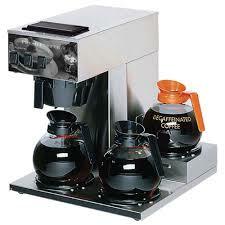 Built with style, precision, and innovation, this machine will help you profit from the booming hot beverage trend. The Cafe Diem serves up to 15 different hot beverages, including 3 fresh brew coffees, specialty gourmet drinks, cocoas, and teas, as well as soup. The "QuickSelect" memory feature allows consumers to enter a personal code for simple repeat purchases of their favorite hot beverages. A motorized dispensing spout adjusts to different cup heights to ensure precise fill levels with minimal spills and drips, so the cup well stays clean.